Reports of human rights abuses continue to haunt NYU’s overseas projects. This article was originally published by the NYU Local and is reposted here with permission. If you think NYU’s administration learned its lesson from the alleged abuses of migrant laborers, Human Rights Watch would like to tell you otherwise. On Tuesday, the prominent NGO released a new report on the alleged exploitation of the migrant workers who built NYU Abu Dhabi, as well as projects for the Guggenheim and Louvre. Human Rights Watch has released two earlier reports on the issue in 2009 and 2012. 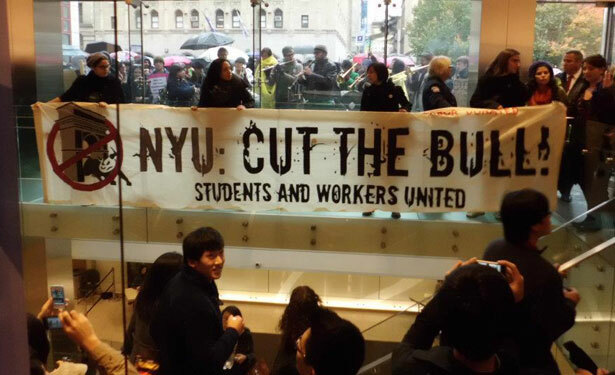 After the 2009 report chronicled several abuses, NYU agreed to create a statement of labor values. These include prohibitions against forced labor, harassment or abuse, and discrimination. Human Rights Watch has praised the guidelines as a step forward. Discussing the research conducted for the most recent study, McGeehan stated, “When we went back we found the same problems.” Workers reported not having passports, paying recruitment fees that were not reimbursed, and living in squalid housing conditions. “The most serious allegations are the deportations,” said McGeehan. In 2013, a few years after NYU had implemented its statement of labor values, hundreds of workers building NYU Abu Dhabi were arbitrarily deported. The workers had organized a strike to protest their working conditions and pay. In response, the police and BK Gulf, the contractor NYU hired to build its Abu Dhabi site, collaborated to arrest forty workers they accused of leading the strike. These workers were deported after nine days in prison. Between 200 and 350 other workers would be deported as well. Joined by others in the panel, O’Driscoll expressed his wishes that NYU would be willing to compensate the deported workers, as a first step in addressing the most recent abuses. Some of the workers interviewed by HRW said they were in debt, despite having worked long hours, six days a week. NYU President John Sexton, a vocal champion of the Abu Dhabi expansion, is scheduled to be awarded a $2.5 million bonus this year. Ryan McNamaraRyan McNamara is an undergraduate student reporter for the NYU Local.